How Michael Dell changed personal computing forever. Michael Dell revolutionized the personal computer industry by skipping the middleman and selling computers directly to the customer at home. He also innovated PC manufacturing by developing a process to mass-produce individually made-to-order computers, a process that Dell still uses to power the backbone of their personal computer business to this day. His outlook on the technology industry and supply chain innovations he led at the helm of Dell changed the IT industry forever. Dell then enabled customers to order these personalized computers directly online, as one of the first online retailers selling personal computers that could be custom-ordered and shipped directly to your home. His innovations in manufacturing and distribution have made him one of the most successful businessmen of our time. Michael Dell, born February 1965, purchased his first calculator at age seven and encountered an early teletype terminal in junior high. He was always of a technical mind, and at age 15, after playing with computers at Radio Shack, he got his first computer, an Apple II which he promptly disassembled to better understand how it worked. Dell's real road to success launched out of his University of Texas dorm room in 1984 with just $1,000 and an idea to provide affordable personal computers to college students. Dell still remains the CEO of his company with a net worth of over $30 billion at its peak, ranking him as one of the top 40 wealthiest people in the world. On top of that, Dell became the world's youngest CEO of a Fortune 500 company. Much of the company's success is owed to the fact that Dell revolutionized the personal computer buying process and sells primarily direct to the customer to avoid middleman markups. In 1998, Dell formed MSD Capital, a public equity investment group that invests in publicly traded securities, private equity deals, real estate and other business opportunities. In 1999, Dell and his wife established the Michael & Susan Dell Foundation to provide philanthropic support to a variety of global causes including urban education, college scholarship programs, funding of health and wellness initiatives and more. Dell is one of the world's largest PC manufacturers, growing from $6 million annual revenue to over $22 billion per year in just sixteen years. The hyper-growth the company experienced is almost unparalleled in the world of technology products. The company now employs over 103,000 people in more than 170 countries worldwide. Dell’s product line has diversified to includes not only PC’s and network servers, but storage systems, printers, hand-held computers, MP3 players, televisions, plus a wide selection of computer-related services. For many years, Dell was the largest online computer retailer, selling an average of $30 million in revenue a day. 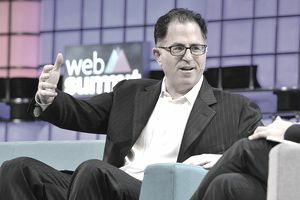 After going public in 1988 and being listed in many of the most renowned trading indexes, Michael Dell took the company private with an acquisition in 2013, in what was the biggest management buyout since the Great Recession. In 1992 Michael Dell became the youngest CEO ever to earn a ranking on the Fortune 500. Dell has also been recognized "Entrepreneur of the Year" by Inc. magazine, "Man of the Year" by PC Magazine, "Top CEO in American Business" by Worth magazine, and "CEO of the Year" by Financial World and Industry Week. Dell Computer is also Fortune’s "America’s Most Admired Company" and #3 globally. Michael Dell is the author of Direct from Dell: Strategies That Revolutionized an Industry. The book includes the story about his rise to the top and also chronicles his business philosophy. Not even the age of forty and Michael Dell is one of the richest people in the world.